I took this picture at Kuti Game Ranch, near Salima, Malawi. The ostriches are kept in a large pen but always come to see the people standing next to the fence. 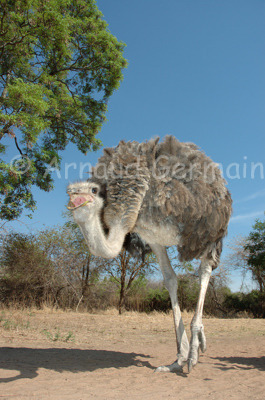 For this shot, I laid on the floor next to the fence, looking up towards the bird and added a touch of flash in order to give the ostrich her natural colour. When she came too close, I just rolled over away from the fence as these birds are known to peck!